MERIDEN - The Bristol Central boys basketball team started slow, but rebounded for a key 61-60 victory at Platt on Friday night, inching closer to a state tournament berth with the upset. The Rams trailed 17-9 after the first quarter, narrowing the gap to six points (32-26) at halftime and three points (48-45) after three quarters. Bristol Central (6-8) was led by Donovan Clingan (25 points), Austin Brown (10), Sean Wininger (10), Ryan Rodriguez (7) and Victor Rosa (5). Platt (9-6) was led by Roemello Leary (17 points), Malcolm Andrews (12) and Trey Carter (10). Shepaug 45, Terryville 32: Ethan and Owen Hibbard each scored 13 points and visiting Shepaug pulled away from Terryville in the fourth quarter. Devonne Dao led the Kangaroos with 15 points, followed by Albert Molina (7) and Sean O'Donnell (6). St. Paul 63, Wolcott 33: The Falcons improved to 16-2 with their 11th straight victory, winning at Wolcott on Friday night. St. Paul was led by Janessa Gonzalez (21 points), a triple-double from Jade Udoh (15 points, 11 rebounds, 10 assists), Olivia Stump (8 points), Catherine Ciampi (6 points) and Emma Cretella (5 points). Wolcott (5-13) was led by Adrianna Ferrucci’s 13 points. Bristol Eastern 51, Maloney 24: The Lancers improved their season record to 9-7 with a win at home over Maloney on Friday night. Bristol Eastern led 11-4 after one quarter and 30-7 at halftime en route to the win. Jordan Ouellette (14 points) and Ciara Collins (11) were the leading Lancer scorers. Avery Arbuckle added eight points and Sage Scarritt scored six. Meredith Forman scored four points and had five steals and three assists in a strong effort. Collins had four steals and four assists, while Ouellette was the leading rebounder with eight. 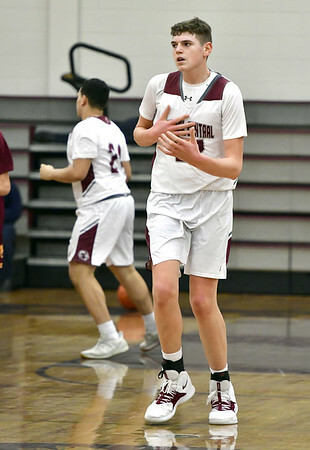 Bristol Eastern has three games this week, on Monday at Wethersfield, Thursday at home against Plainville and Saturday at home against Rocky Hill, before closing out its regular season next Monday with a game at Bristol Central. BRISTOL CENTRAL: Victor Rosa 1-3-5, Austin Brown 3-3-10, Nate Rosa 1-0-2, Damion Glasper 0-0-0, Will Almodovar 1-0-2, Sean Wininger 4-0-10, Donovan Clingan 12-1-25, Ryan Rodriguez 2-3-7. Totals: 24-10-61. PLATT: Adriel Gill 1-1-3, Trey Carter 4-2-10, Malcolm Andrews 5-0-12, Eli Wright 4-1-9, Roemello Leary 7-0-17, Anthony Lorenzo 2-0-4. Totals: 24-6-60. Three-point goals: Brown (BC), Wininger (BC) 2, Andrews (P) 2, Leary (P) 3. Records: Bristol Central 6-8, Platt 9-6. SHEPAUG: Cole Donaghey 1-2-4, Owen Hibbard 5-3-13, Jack Schneider 4-2-11, Dom Perachi 0-0-0, Joe Brunelli 1-1-4, Ethan Hibbard 5-3-13. Totals: 16-11-45. TERRYVILLE: Dominic Dao 0-0-0, Albert Molina 2-2-7, Devonne Dao 5-3-13, Colin Bamrick 1-0-2, Sean O'Donnell 2-1-6, Jacob Zappone 1-0-2, Zack Rinkavage 0-0-0. Totals: 11-6-32. Three-point goals: Schneider (S), Brunelli (S), Dev. Dao (T) 2, Molina (T), O'Donnell (T). Records: Terryville 4-10, Shepaug 9-5. ST. PAUL: Maddie Farrell 1-0-2, Kailyn Bielecki 1-0-2, Olivia Heslin 0-0-0, Emma Cretella 2-0-5, Janessa Gonzalez 8-2-21, Olivia Stump 2-2-8, Catherine Ciampi 3-0-6, Morgan Kolb 0-0-0, Hannah Stanford 1-0-2, Ashley Suzio 0-0-0, Jade Udoh 5-4-15, Sophia Gerst 1-0-2. Totals: 24-8-63. WOLCOTT: Emiah Soto 2-4-8, Kalani Rodriguez 0-0-0, Hannah Francisco 0-0-0, Allison Leclerc 3-0-6, Ella Vaugh 1-0-2, Adrianna Ferrucci 4-5-13, Flora Alka 2-0-4. Totals: 12-9-33. Three-point goals: Cretella (SP), Gonzalez (SP) 3, Stump (SP) 2, Udoh (SP). Records: St. Paul 16-2, Wolcott 5-13. MALONEY: Alexa Papallo 1-0-3, Liv Aitken 0-2-2, Courtney Ubquike 3-0-6, Abby Lespier 1-0-3, Gracey Mssicotte 2-0-5, Mackenzie McCormack 2-0-5. Totals: 9-2-24. BRISTOL EASTERN: Paige McLaughlin 0-1-1, Julia Gettings 0-1-1, Meredith Forman 1-2-4, Ciara Collins 5-0-11, Alyssa Kehler 0-0-0, Audra Porowski 0-0-0, Amaya Massari 1-2-5, Sage Scarritt 3-0-6, Maura McGuire 0-1-1, Jordan Ouellette 6-2-14, Grace D'Amato 0-0-0, Avery Arbuckle 4-0-8. Totals: 20-9-51. Three-point goals: Papallo (M), Lespier (M), Massicotte (M), McCormack (M), Collins (BE), Massari (BE). Posted in The Bristol Press, Bristol Central, Terryville, Bristol Eastern on Monday, 4 February 2019 15:56. Updated: Monday, 4 February 2019 15:59.